Sindi Dlathu who goes by the real name Sindiswa Dlathu is a South African actress. She was born on the 4th January 1974 in Meadowlands, Soweto Johannesburg (JHB) in the Gauteng province of South Africa. She is popularly known for her role as ‘Thandaza on Muvhango which airs on SABC 2. She was born on the 4th of January 1974 in Meadowlands, Soweto Johannesburg (JHB) in the Gauteng province of South Africa. As of 2018, she is 44 years old. Sindi Dlathu is married and has two kids. She keeps her family very private. Up to now, her children and husband have never been written about in the media. She is married to Bheki Shongwe and together they have two children. 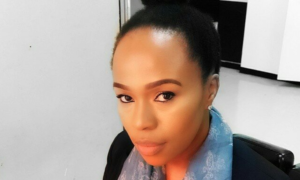 As revealed by the Tabloid, Sindi Dlathu, who plays Thandaza on SABC2’s Muvhango, is the highest-paid actor in the corporation, with a salary of about R85 000 a month.